I grow tomatoes every year in my garden and roast them long and slow in the oven. The plan is to freeze them so I have garden grown tomatoes all year long, but usually I just eat them straight from the pan! I love the rich red tones in this painting, especially with the lime green couch behind the model! Grapes and cantaloupe, two of my favorite fruits...though I admit it is much easier to pick good grapes than a good grapefruit! Luckily even if they don't taste perfect, they work great as models for painting! Shiny jewels on a turquoise plate, these grapes are too beautiful to eat. Only one thing to do, paint! Coyotes are tricksters, song dogs, and neighbors. Problematic as they are (one ate a couple of my chickens! ), I love to hear them sing at night while I lay in bed. Red and ripe these strawberries are a treat all by themselves...though if someone were to offer me some shortcake and whip cream to go with them, I wouldn't say no! We have ravens where I live. They are huge, intelligent birds who fly over my head so low that I can hear their wings beating before I see them. Coffee and a chocolate croissant, the perfect way to start the day. Also, oh my gosh guys, it was so hard not to eat the entire croissant instead of painting it. SO HARD. 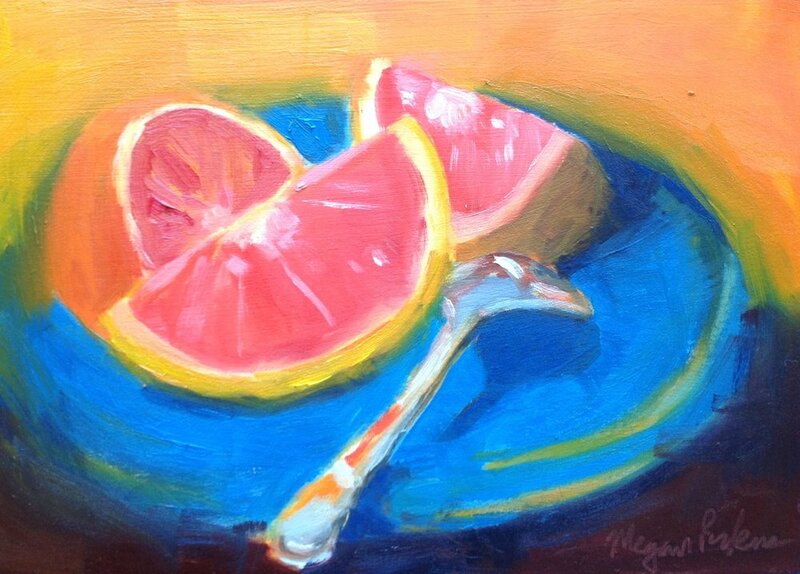 I don't much like eating grapefruit but it sure is fun to paint them! I live near the Palouse. Big skies over fields of green and gold are a treasured part of my life. I'd like to share a bit of that with you. I have a friend I've known since I was nine. We've gone to different schools, moved away, moved back, grown up (mostly! ), but I count myself lucky to still be friends with this fierce, beautiful, loving lady. When we're together we always end up laughing uproariously and I always love catching up with her life...wrangling teenage boys at a Catholic school, learning Krav Maga, driving a convertible in Hawaii...this lady cannot be stopped! Rifling through a bin at a local vintage store, I found a black and white photo of this lady. We locked eyes and I knew I needed to take her home with me. 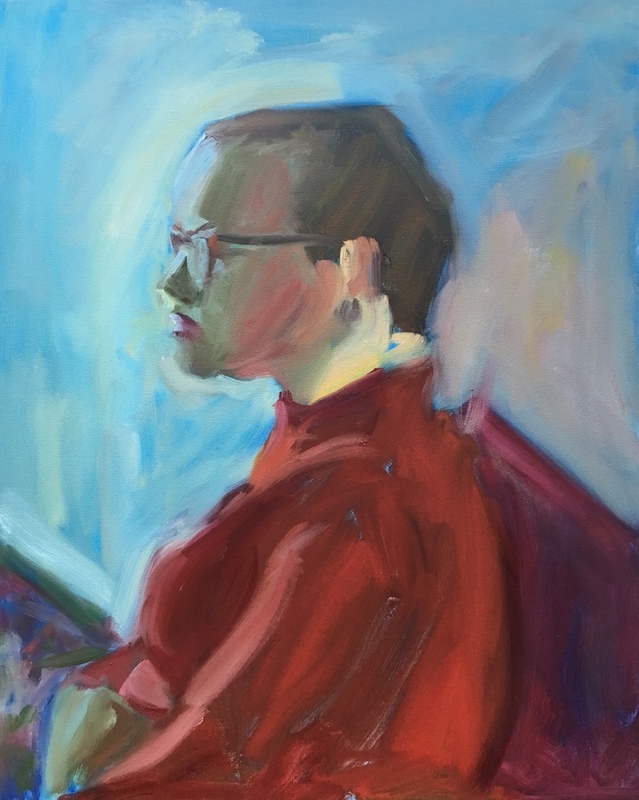 Trying to imagine her in our technicolor world resulted in this painting. 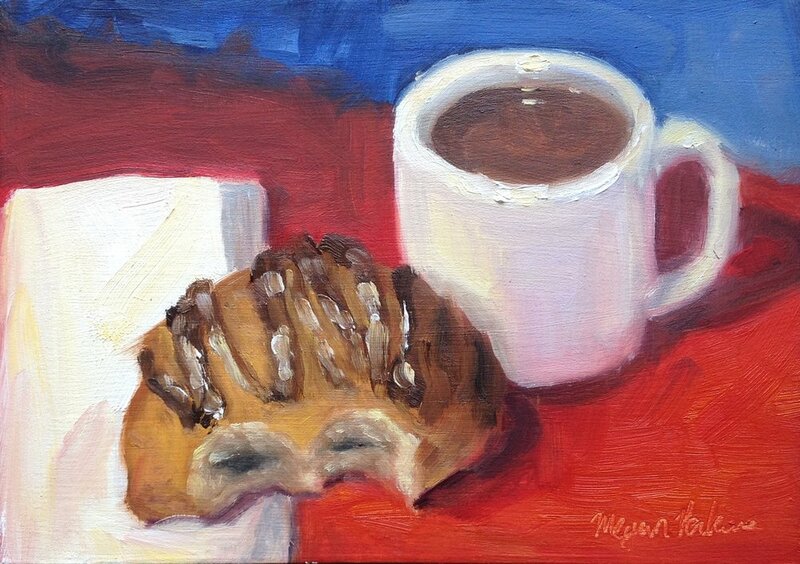 I bought this pastry from a local bakery specifically to paint it. The frosting was just so much fun! Looking at this painting takes me back to a day hiking in the Italian countryside. We walked the fields, saw a ruined abbey with a missing roof (the monks sold the roof! ), and exclamation point after exclamation point of cypresses! Cypress and towers and olive oil, some of my favorite things from the time I spent living in Italy. 5" x 7" painted on wood panel with 1" cradle. I love the little mini pumpkins that you can buy to decorate your table at Halloween. They are just so adorable! A warm cup of tea with lemon and honey hits the spot on a cold day! Every fall that I studied on Gonzaga was marketed by chestnuts. There is a stand of the trees by the old Administration building and every fall they would drop their spiny seed pods and shiny chestnuts would fall out. Walking by on my way to class, I could never resist picking a few up and putting them in my pocket to carry with me. Inspired by a black and white vintage photo of a woman who seemed like she had been through a lot in her life. I wonder what her story was? Zinnias are one of my favorite flowers. They are so cheerful and come in so many colors! I start them from seed so that I can have as many as possible and set them out in the garden in a riot of bloom. Being from Washington State, apples have always had a soft spot in my heart. I love the overlapping petals on an artichoke and the hints of purple in the green globe. 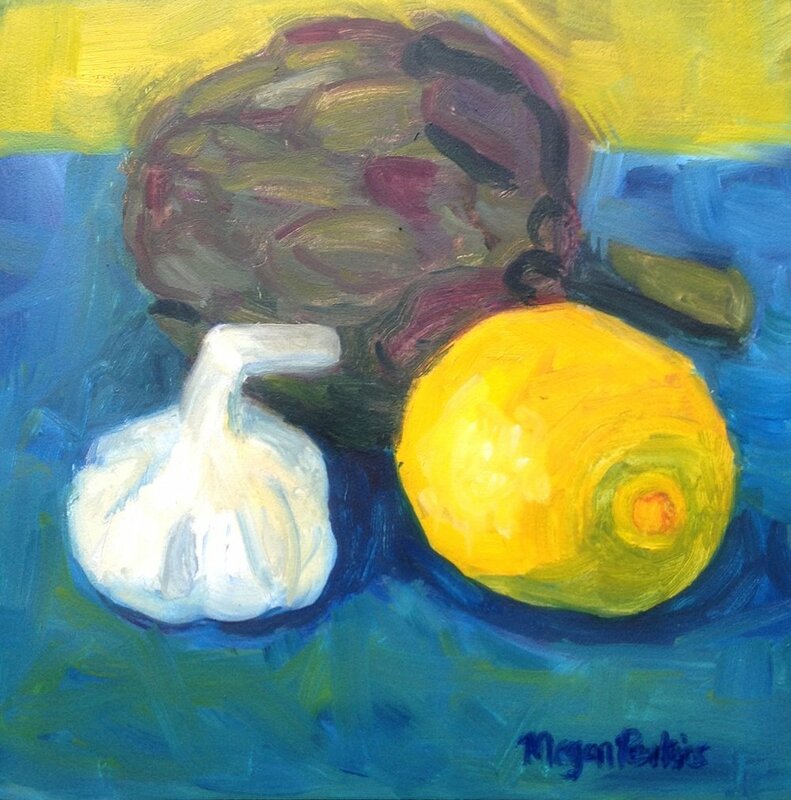 Arranging this still life, I might have been thinking a bit about what artichoke *tastes* good with, not just looks! Though I left out my favorite thing to have with artichoke-butter! I found this tiny brown tea pot at the thrift store and when I got home it went really well with a mug I already own. A great match! Mr. Ducky was already in the house when we bought it. I found him on the very top shelf in the shower. He smiled at me. I smiled back and brought him into the studio. A study of native plant commonly considered a weed by farmers in my area. Still, I love mullein for its tall stalk, sometimes bent like twisted candelabras and big soft leaves. Somehow I got it into my mind that African Violets are fussy plants and so, never bought one for my house plant collection. This one was gifted to me by an African Violet master. I'm still nervous about keeping it alive so I decided to memorialize it in paint, just to be safe! Pomegranates are the weirdest fruit in the world, but there is something about their shape and their color that reminds of jewels-rubies and garnets to be exact. Delicious, delicious jewels! Home grown tomatoes in different shades. Every year I grow amaryllis and document it from bud to full bloom. They are such dramatic flowers and so large that it is easy to see the changes that happen day to day in the flowers and when they fully bloom I find every bit of the wait worthwhile. I love them so! Several years ago I worked at a plant nursery and we had a problem with starlings nesting in our displays and plants and attacking customers. Eventually we had to start finding nests and dumping the eggs out of them in the hopes that the starlings would move on. I kept a couple of the nests and at the end of the summer while weeding under some shrubs, I found this bird skull. It seemed fitting to paint these two together in memory of those troublesome birds and what we had to do. Blue and yellow have always been a favorite color combination of mine. A chest of drawers at the end of the hallway, the golden light of afternoon casting shadows on the wall. A study in orange and blue.